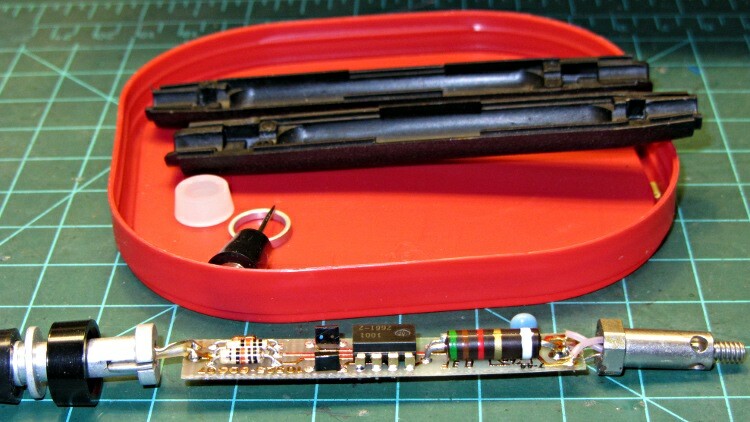 While putting together the PIR sensor, I had occasion to haul out the old HP10525T Logic Probe (a bookend for the Tek logic probe) to figure out why the shift register wasn’t updating; that was easier than hauling the breadboard to the oscilloscope. While it showed the problem (wire tucked into wrong hole, hidden behind a cluster of other wires), it didn’t seem to be blinking quite right. The HP10525T Logic Probe Operating and Service Manual says it should blink at about 10 Hz for any pulse train from about 10 Hz up through 50 MHz (yes, 50 megahertz), with a minimum pulse width of 10 ns (yes, 10 nanoseconds), but it didn’t do that for the PWM going to the RGB LED strip or the shift register clock. Buttoned it up again and … it works fine. There really isn’t that much else to go wrong, is there? I love happy endings, although I’m sure the accompanying HP10526T Logic Pulser needs recapping, too. When that project comes around, I’ll probably use SMD ceramic caps, because the pulser’s circuit board packs even more parts into the same volume. Speaking of unhappy endings, HP used to be run by real techies: The Fine Manual’s body starts with Page 0 verso, after the title and two pages of front matter. ‘Nuff said. This entry was posted on 2012-12-20, 07:50 and is filed under Electronics Workbench. You can follow any responses to this entry through RSS 2.0. Both comments and pings are currently closed. I’ve had a few of those fail with the dreaded “ESR went to zero” problem. As in putting a short circuit across power supplies my 1979-vintage Tek 465B. They’re probably about as old as the probe, so they’re getting along in years, too. Not familiar with Agilent’s test equipment, but that where the tech-heads ended up when HP decided to become a computer-only company. (A lot of the businesses were spun off Agilent, medical being first, with semiconductors following.) Note of irony: HP got into computers as a way to control the test equipment. And should have left the HP name with the test equipment / tech biz, where it belonged. Ptui! I went to high school a long time ago, when there were televisions with mostly vacuum tubes. In my junior year, I went to work part time for a TV repair shop, thinking I would learn electronics from gurus. What I did learn instead was that they were basically salesmen, but, they had files full of Sam’s “Photofacts” which had all the information you would ever need to repair a set, even if you had no clue how it actually functioned. The photos would show where to put the scope probe, how to set the scope and pictures of the wave-forms. Most of the manuals that I saw had step by step directions on how to troubleshoot a set. On Saturdays they had a university student fix the sets that they couldn’t and I got to do the antenna work on the scary slate roofs. Today it is very hard to actually get the technical specs for most electronics gear much less repair it. This may be the Golden Age of RF and analog hacking, but the fact is you can’t repair anything because all the functions reside inside a honkin’ big digital chip that you can’t probe or (un)solder or modify. From what I’m seeing, it looks like bad caps might be the biggest hardware failure mode for medium-old equipment. Well, alongside NiCd batteries that go toes-up. I’ve got a shaver that won’t power up anymore–glad I’m usually bearded. (Won’t get into firmware that doesn’t understand Y2K…) I’ve been cleaning the gubbage from the work room for a marathon fixit session–too many projects, too much bad weather.